A team led by Dr Carmel Kelly, Consultant Nurse in Sexual Health in the School of Nursing and Midwifery at Queen’s, who holds a joint appointment with the South Eastern Health and Social Care Trust, has picked up awards for an inventive way to improve the sexual health of men in local prisons. 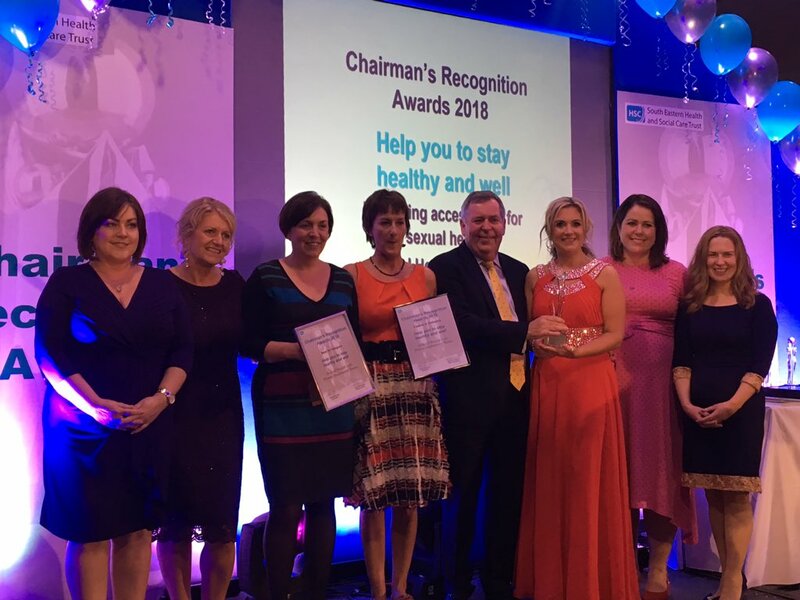 Accolades for the pioneering nurse-led prison sexual health services and health promotion included 1st prize at the South Eastern Trust Chairman Awards held on 19 October and two silver awards in the HEALTHCARE CAMPAIGN and BEST USE OF CONTENT sections at the 2018 CIPR PRIDE Awards on the same day with Morrow Communications. Dr Kelly’s team, which included Dr Michelle Templeton and Professor Maria Lohan, worked with partners in the South Eastern Trust to complete a research project which has led to the establishment of the first nurse led asymptomatic screening service for sexually transmitted infections (STIs) within prison healthcare. Along with a group of young men from Hydebank Wood College, they developed an animated video – Dickey Luvs Doot – which promotes a positive attitude to sexual health testing among men across Northern Ireland’s prisons and which is now available on YouTube. Speaking earlier in the year Dr Kelly, explained that the project had two strands: “Firstly, we introduced a nurse led initiative to provide asymptomatic sexual health check-ups for patients. Prior to this the medical consultants mostly saw patients who were showing symptoms. The video was launched in March 2018 at Hydebank Wood College when the Hydebank Governor Richard Taylor, the Chief Medical Officer Dr Michael McBride and researchers from Queen’s School of Nursing and Midwifery were in attendance. Dr Michelle Templeton, Research Fellow in the School who has experience using participatory methods with children and young people also worked on the initiative. Dr Templeton said: “This project is an excellent example of how key health messages can be communicated to young men in a meaningful way. Professor Maria Lohan from the School Nursing and Midwifery who was Co–Investigator in the project added: “Hydebank Wood College has been key to the success of this project because it is a European leader in promoting innovative approaches to the rehabilitation of young male offenders through education. Dr Michael McBride, Chief Medical Officer said: “The health needs of the prison population are much greater than the community as a whole. This includes the area of sexual health which is an important part of overall physical and mental health. Media enquiries to Jemma Greenlees at Queen's Communications Office on tel: +44 (0)28 9097 3087.